Written by Bonita Hutcheson and edited by Thea Hutcheson in 2013. Special recognition goes to Matthew E. Salek for his wonderful history of the Colorado roads and highways web page which contributes to this continuation of the 2012 booklet discussion of major transportation routes, toll roads, and railroads that cross the city east and west, and north and south. US 285, the major divider in the City, is sometimes called Hampden Avenue because it was originally the road to the Fort (near Denver) that was established by the Federal Government in 1887, it ran from the railroad tracks along what is now Santa Fe, turning south at what is now Lowell Boulevard (also shown on the 1915 map as Sheridan Avenue), crossing Bear Creek and running all the way up into the Fort, ending there. A 1915 map of the area shows this as named Sheridan Avenue (Hampden Avenue) and also County Road No. 14 (No. 35). This major highway runs east and west through the City of Sheridan and beyond is actually marked north and south on the highway signs. It is rather confusing to everyone except those who use the highway. The road to the Fort was built by the Federal Government, and [we believe] was maintained by them. In 1927 the Second Engineers came in to do repair and upgrades to the Fort. They paved both Hampden Avenue and Oxford Avenue with concrete. They also updated the houses in the Fort area by adding and removing porches, replacing roofs and performing a great deal of changes inside as well. Later the State Highway Department extended Hampden to the west, beyond Lowell Boulevard, relocating parts of it to open ground so it could be widened. 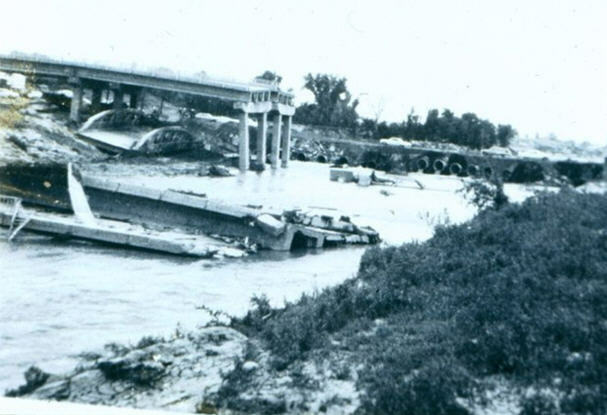 In the flood of 1965 the old city bridge crossing the Platte River and south of the highway bridge, was struck by trees, mobile homes, this big metal bridge then struck the state bridge on the highway over the Platte River. It was so damaged in the collision, both had to be removed and replaced. Parts of the original Hampden Avenue are still in use in the north part of Sheridan [and in Englewood], now known as Old Hampden. Expansion of the highway took a great deal of land from Petersburg as well as other farmland to the south and divided the town. Over the years, U. S. 285 has been widened, upgraded, and improved, with some new bridges being built. In 2012 an overpass replacement was constructed over Federal Boulevard for U.S. 285. Traffic in 2008 counted at 63,500 vehicles per day. Looking south up the Platte River following the Flood of 1965. The old City Bridge lies under 285. Part of the 285 Bridge over the Platte is half submerged in the foreground. Old Hampden is a very special street in Sheridan. Much of it will become commercial in the next few years, as it is a busy road now, especially where it leaves or enters the Highway or South Federal Boulevard. State Highway 85, or Santa Fe Drive, as we know it today, was called Main Street and ran through Petersburg Subdivision, named by Peter Magnes , who was very active in the community and the County. It was later changed to Santa Fe for the Santa Fe Railroad which ran on the tracks to the east of the subdivision, and later used by other railroads. The 1915 map shows Santa Fe was County road 12(30); Main Street; and Mohawk Ct. In Sheridan it created a thriving business center, with the Petersburg Hotel, The Wayside Inn, pens for herds of cattle, an office for Edward Bean, known as the Marrying Judge, who also served the Petersburg and Littleton area for Justice of the Peace, the Post Office, and the Petersburg School; as well as a number of merchants and a newspaper. The 1915 map shows Federal Boulevard, Hghway 88, also known as County Road 126, and by the military as Military Road. Federal was still not paved south of Mansfield in 1963 and remained a dirt road for some time, and was later extended to Bowles Avenue in Littleton. Around 1969 Shirley Minter organized a group of her neighbors to get the Highway Department to put in sidewalks on South Federal for the children attending the junior high school at Fort Logan School and the Sheridan Union High School. Later on, she and her husband Joe purchased Monaghans Bar and Restaurant in Sheridan [South King and Mansfield Avenue] and ran it successfully for many years. They made the best hamburgers ever. They put an addition on the north and offered dancing and private parties. Several pool tables were in the bar section and customers enjoyed them. The street was used by the military and the 1915 map shows it as County Road #30, No 1103 and (Fort Logan Broadway) [sic]. The area was the route of the Uncle Sam Train as it turned from the tracks at Santa Fe, west along the south side of Oxford Avenue. This train was a valuable transport not only for the military, but those people who lived in or near the Fort. The tracks ran across the Platte River and turned near what is South Clay Street, making its way west and on to the Fort. It not only delivered supplies and troops, but also goods to the businesses that were in the town of Sheridan, known locally as Logantown. Since it crossed South Lowell Street as it entered the Fort, the station was built right of the corner of South Lowell and West Mansfield Avenue. The hotel was built directly behind the station. 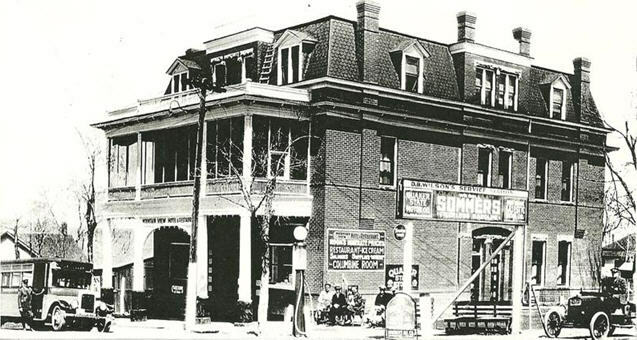 The Star Hotel sat at the corner of Lowell and Mansfield, directly north of the train depot from 1902 until it was destroyed by fire in the 1960s. Its proprietors, listed in the Colorado Business Directory ,included Patrick Sliney (whose Patrick Sliney Saloon had been listed several years previously), W.J. Bruner, C.B. Jones, D.B. Wilson, and, as the Mountain View Hotel, Anna M. Wilson. While not in great use in the early days, it is now a very busy road. The 1915 map shows it as County Road No 50 and #1164. This is the other east-west road in the City of Sheridan, and is primarily warehouses and, later, residences. Dartmouth is divided in half down the median, marking the northern boundary for Sheridan on the south and both Denver and Englewood boundaries on the northern half. This road ends at what had been Loretto Heights University on the west, but on the eastern edge of the college, it continues on. All of these roads provide major access to and from the Denver metro area and beyond and provided an important juncture for travel and commerce in all directions.